Sounds like everyone had a great ride. Shannon's put up a link to a video and some pictures in the forum post about this ride, I'm just re-posting here on the main site. 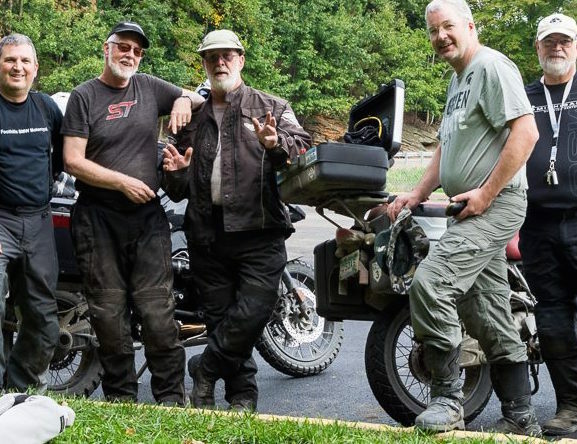 Join one of the last TCD dual sport rides for 2016, down into southern Indiana. This is a great dual sport ride through the rolling hills and forests of southern Indiana. Friday 9/23 – ride to Martinsville IN. Saturday 9/24 – ride from Martinsville to Tell City via country, farm, and forest roads. Mostly gravel. Sunday 9/25 – ride from Tell City to Shelbyville, In via country, farm, and forest roads. Mostly gravel. Monday 9/26 – ride back to Detroit area. Friday and Monday are travel days, so if you want to boogie down and back via freeway you don’t need to join the ride down and back. I will plan a back road ride mostly pavement for those days. The Saturday and Sunday rides do contain maybe three Hero sections (more if the weather is wet). There are workarounds for anyone who wants to skip them. You probably will have difficulty with the Hero sections on street tires. The rest is doable on street tires with care, but you will feel more comfortable in the gravel with an aggressive tread. See the BMW TCD forum for more details.